I'm wondering if some of my geneablogging mates have run out of steam or escaped the cold in search of warmer climes as there have been fewer posts come through in my RSS feeds this week. Nevertheless I do have some Gems to share with you. 1. Lilian asks: Which magazines do you read? 3. I used love visiting this place as a child. What I like about blogging is that it provides a dynamic environment for one to write family stories. This is so useful when further research or reading leads to new information and insights. 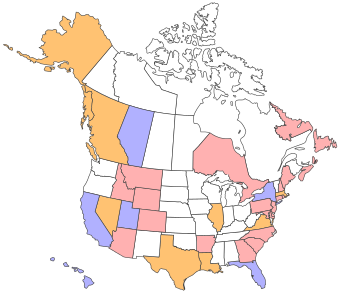 My most read blog post about my grandmother's first husband John Bertram Chatfield was published in 2011. Today I have added this postscript to the original post. It is frustrating to fins that some of the links in my original post are now dead. I have amended these and they are live at this date. When I settle in for a session of Australian research from home I open up a collection of tabs on my browser so that I can jump from one site to another with ease. I am sure that many of my genimates have a similar setup. Of course these are not the only resources I use but they are a good starting point. In the past few months I have been going through my database and checking the entries systematically (I still have a way to go). Having these tabs open is of great assistance. I am wondering what your collection of tabs looks like. I love libraries and feel very comfortable within their walls.I have to admit that during my paid working life I was a Librarian at Waverley and Randwick Libraries and at half a dozen privaye schools around Sydney. As a family history sleuth I have visited a number of Libraries in Australia, the UK and US trying to find clues to our ancestry. In fact I'm visiting our State Library tomorrow. Through Libraries we have found details of cousins, graves, homes, articles in newspapers and maps to help our ancestor hunting. This week is Library and Information Week in Australia. How about giving a shout out to your favourite library. The hashtag for the week is #LIA15. I don't often take part in Randy Seaver's "Saturday Night Genealogy Fun" activity becaause my weekends are usually filled with activities with my living family. I have ignored parts 3 and 4 of Randy's challenge as my ancestors came from other countries. I think I have done pretty well for an Aussie. The map is useful to us as Mr GeniAus and I are planning a road trip after Rootstech 2016. I just wonder which white parts will be warm enough for touring in February! I'm back on track this week and have a few posts to share with you. I am not claiming that the posts I share are "The Best" for the week; they are posts I have entertained, educated or informed me. The weather here in Sydney today is miserable but the collection of GAGs I have to share is far from Miserable. ENJOY. 1. I learnt about a new resource from Caitlin. 3. I learnt of a new database from The State Library of Victoria. 4. I was thrilled to hear this news. 5. I liked Tiggy's busyness solution. 6. I enjoyed a new non-genealogy blog from Lorraine Phelan. 8. I'll be subscribing to this new RSS feed from SLNSW. 10. I was pleased to see a post from Western Australia. My mate Paul Milner who was one of the standout speakers at the recent Genealogy Congress in Canberra has emailed me with details of some webinars he will be delivering. I can recommend Paul as a knowedgeable and engaging presenter. Full details can be found on Paul's website. The topic for these presentations is "An In-Depth Look at the ‘Big Four’ Records of English Research." As we prepare for our next holiday which includes a tour to The Western Front I thought that Mr GeniAus and I should do some background reading. My son kindly offered to lend us his copy of the prizewinning book "The Great War" by Les Carlyon which he says that although it's over 1,000 pages it's an easy read. On the weekend he delivered this together with another 900 page tome for us to read. A strapping young lad like my son might be able to read these heavyweights with ease but his poor old Mum tried to bond with Les in bed the other night and I just wasn't up to the challenge. The Great War is just too heavy for an old girl who snuggles up under the covers to read at night. Although I prefer 'real' paper books I thought that this was a case where an ebook would be better so I popped into the Playstore and bought myself a copy. I am pleased to report that the book is now accessible from my phone and tablet and that I have made a good start on reading it. Mr GeniAus who is stronger than I can have the printed copy all to himself. 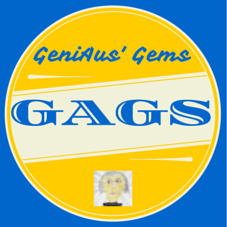 A busy few days with the family prevented me from publishing my list of GeniAus' Gems or GAGs on Friday this week. It's now Sunday morning, the visitors have had their breakfast and are on their way home again. We relish spending time with the children and grandchildren so we can't let genealogy get in the way of their visits. I have a few GAGs saved over in my Evernote folder that I'll share with you today. I'll aim for Friday again next week. 1. Join Lynda on a visit to the Singapore Archives. 7. I wonder if this blogger with an Australian story is named Joy. 8. Caitlin is "over the moon". 9. Barb describes her Hawaiian ANZAC Day. 11. Reeling in readers via GSQ. 12. A mystery solved at Stockton. Sometimes as I am practising Tangential Genealogy I find some great new stuff. Occasionally when I search for an ancestor's name on Google I am directed to the Heaven Address site where I might find death and funeral details, sometimes there are tributes posted by family and friends and sometimes there is a collection of photos of the deceased. Until I returned this week the only entries I found at this site were only for deaths in recent years. On its home page Heaven Address claims to be "the respectful online memorial community to honour and celebrate the lives of your loved ones." One can join Heaven Address but there is no need to do this to search its database. What I found this week, when I decided to search Heaven Address for the surname Curry for my CurryAus Surname study, were some old records back to the 1920s. In fact I found enough information to help me reconstruct a few Curry families. I was under the impression that only funeral directors contributed to this database but it appears that a small group of cemeteries and crematoria are adding records with maps and GPS coordinates of graves. This must be fairly new as many records, such as William Curry's (below) indicate that they have not yet been inscribed. NSW Cemeteries contributing to Heaven Address. This is a very useful database to add to your Genealogy Toolbox especially if you are undertaking a surname study. Last night I uploaded an updated gedcom file to my family databaase at www.geniaus.net. Since I reported on my last upload I have made changes to 347 records in my database. I have been slowly revisiting the oldest records in my Family Historian database as it is easy to sort by "Last updated". There were many that were last updated on 14/8/2010 when I imported my gedcom into Family Historian. I am pleased to report that I have dealt with most of those that were direct relations of miine. I haven't bothered with husbands and wives of distant cousins. I am happy to just have marriage records for them. I am the Root Person in my database. The diagram below (a sample from the Family Historian spreadhseet like view) shows that most of the people last updated on 14/8/2010 are either not related to me (blank) or are the spouses of our cousins. I'm rather proud of my cleanup efforts so far. Once I have covered some later dates in the "Last updated" column I will move on to seeking more information on my direct line. It is taking quite some effort to stick to my Revisiting, Reviewing and Revising as I am fond of tangential genealogy. Tonight as I was preparing my handout for tomorrow's presentation on Effective Google Searching I was reminded of this one minute Youtube video that I share with participants because it explains why Word Order Matters when performing Google searches much better than I can. I thought some of you might find it useful it too. I haven't posted on this blog for a couple of days but I have been a busy little Geneabee. With an upcoming presentation to a local Probus Genealogy group this week I decided that my Google Search talk was a bit tired so I gave it a major makeover and I am rather pleased with the result. I usually update this talk with local examples before delivering it (and that takes a couple of hours) but it has taken me considerably more time to rejig the whole thing. Of course Mother's Day Week was busy. Instead of hosting the family for a meal on Mother's Day we celebrated with Mum and each family in turn and that took some time but it was nice to share a meal with each of three families and have time to chat. Celebrations started on Thursday with a Mothers' Week event at a grandchild's preschool and will conclude when we catch up with our out of town daughter and family next weekend. Our wedding anniversary was wedged in there too and of course we had to celebrate our stayer status. My family history database is still getting a going over. I have carried out first aid on several hundred more records but I have a lot of cleaning up to do. I try to devote time to this exercise each day. I must upload the changes to my GeniAus Family site this week as it's a few weeks since I have done so. I have blogged today but it has been over at the Geneadictionary and at my CurryAus blog. Do pop over and visit them sometime. CurryAus is the surname study I am working on very slowly; I use the blog to record my progress. I find it useful to record what I am doing and feel that by sharing my journey I may help others. Susan Petersen prompted a lot of discussion on Social Media with her timely post "An open letter to genealogy societies." DearMYRTLE followed this up in a recent Google Hangout on Air. Something came through my email box this week that reminded me that all is not Doom and Gloom. There are some societies that are firmly entrenched in the 21st century. It was a reminder that the latest issue of The Surname Scribbler was in the Members' section of The Surname Society for members to read and download. The Surname Society, which was founded in 2014 as a not-for-profit entity by a worldwide group of experienced genealogists, is an online society with members all around the globe. In addition to the online newsletter the Members' Area hosts all sorts of files like Job Descriptions, an Archive facility for Members' posts, a Membership list, The School of Surnames and Chat forums. For face to face communication the Society uses Google Hangouts on Air.This model could be adopted by societies that have a physical home. But let's get back to The Surname Scribbler. I downloaded the 17 page issue to my hard drive to read at my leisure. It was exciting to see my first regular (lighthearted) column, GeniAus' Gens, amongst the informative posts there. Thanks to the Society organisers for inviting me to write a regular column. Why GeniAus' Gens? I found the word “gen” at http://www.oxforddictionaries.com/definition/english/gen. To “gen someone up” is “to provide someone with information”. As I propose to share information and, Gen is related to Genealogy, I thought “ GeniAus Gens” would fit the bill. I'm proud to be a member of this 21st century group. I love hanging out in libraries. I was able to spend nearly three whole days at The National Library of Australia in Canberra this week, what made my visit even more special is that I was one of the first patrons to use the new Family Section there. In case you missed my post and happy snaps you can see them here. As is usually the case I can't remember which posts from the week I saved in Evernote to share with you. I do enjoy opening up my GAGs folder and revisiting the Gems I read earlier in the week. 1. Andrew shares the story of a brave girl. 2. Sharn says "I wonder if they realised just how often significant fragments of their lives appeared in the news for us". 4. Josh made a rash decision. 5. My shiny new kitchen sink doesn't resemble these. 6. Denise from Florida discusses a new feature on her blog. 8. Janelle's a girl after my own heart. 9. Myrt is Hanging Out. Are you? 10. Have you considered adding your ancestors' names to the Welcome Wall? 11. Michelle has a new blog. ... are among the words you have used when commenting on my latest crazy idea, The NFHM GeneaGala Hangout on Air. What has made me feel so much better about this endeavour are the other words you used: Assist, Count me in, Help, Mark me down, Plug me in, Support. Thanks to my genimates from Australia, England, New Zealand, Spain, The United States and Wales who have pledged support; this promises to be a mammoth event. Anne asked if I was having Themes for the Hangouts. As we will have people from many timezones joining it would be difficult to schedule themes over a 12 hour timetable. At the moment I have divided each of the 4x3 hour sessions into one hour blocks. In the first hour we will Socialise; I will ask panelists to talk about themselves and their interests and efforts in genealogy. In the second hour I hope that guests will hop onto their soapboxes to Spruik ie to promote something or discuss a burning issue. In the third hour we'll do what genies do best we'll Share tips and resources. So our themes for the day will be Socialise, Spruik and Share. Of course I reserve the right to ignore this and just let the conversation flow. It's not too long before I go tripping off overseas again so I want to tie some of you down to definite times. I will go through the Yes responses to each of the four scheduled Hangouts and ask these respondents to commit to a specific time to be online and to think of a topic (or I may suggest some) to discuss. I will leave the Maybes alone for the time being but hope that, if your situation changes you will change your response to a Yes. I will need a mix of Presenters (ie spruikers and sharers) and Panelists (people willing to comment, ask questions during the hangout and chat while I take necessary breaks). 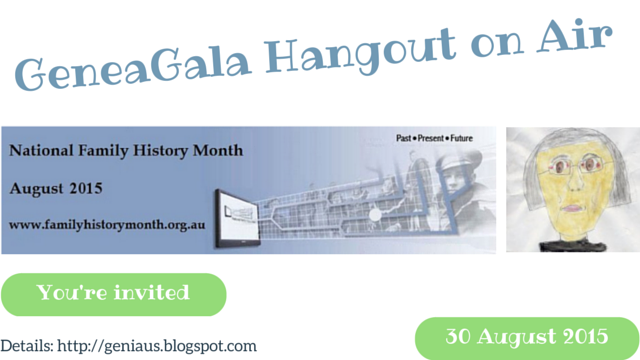 So I've scheduled an all day GeneaGala Hangout on Air during National Family History Month on August 30 here in Australia. It sounded like a good idea but now it's listed on the NFHM website I'm wondering how I will pull it off. You are all invited to take centre stage on the panel and share a favourite resource or software application, promote your society, share your geneatriumphs or ask a question of those on line. Those who are super shy might consider joining the panel as observers and others may decide to watch from within the GeniAus Community or via Youtube. At the moment I am planning 4 x 3 hour Hangouts running one after the other from 9:00 am to 9:00pm Sydney time (that's 11pm UTC 29 August to 11am UTC 30 August). That should enable my friends in the US and UK to join in at some stage. I won't be trying to match DearMYRTLE's effort with the 24 hour geneasleepover last year. I will set up a shared spreadsheet in Google Docs where I'll put up a program for the day. I will ask my genimates to take a look and nominate a time when they will take the stage. I will be contacting some of you by email, the GeniAus Community on Google+ or some other means in an effort to twist your arms! While I am sure that I could talk non-stop for 12 hours, this event will be a flop if it is a solo performance by GeniAus. Please save the date and plan to join in. While traipsing around Trove this morning I came across this piece of history about the Society of Australian Genealogists' Library. Today was the day that the new Newspaper and Family History Zone opened at The National Library of Australia. You can read all about it here on the library site. Until last Thursday this area was on level LG1 (Lower Ground 1 = Dungeon) which while functional enjoyed no natural light. On a good year I get down to Canberra a couple of times to visit the library, sometimes I only make it once. As luck would have it I was in the library at around 10:03 am today not long after the area opened. I was one of the first patrons in the area when I collected some files that I had ordered in. How cool is that! There may have been an opening party but I saw no evidence of any fanfare; I saw several staff members including Mr Trove, Tim Sharratt in his red sneakers, pop in to have a look. The new area is on the Ground Floor and is an extension of the Main Reading Room, it is light, bright and cavernous. There's plenty of room for growth. Of course I had my camera in my bag so I took a few snaps of the new area that has natural light flooding into it from two sides. Thanks to the people at our National Library for providing such stunning new facilities for Family Historians. This week has been an important week in Australian history as we celebrated last Saturday, 25th April, the centenary of the landing at Gallipoli, Turkey early n World War 1. Australian geneabloggers commemorate thier family members and other brave ANZACS in a swag of blog posts about our fighting men. I cannot single out any post as outstanding, they were all magnificent tributes. I must mention four Australian geneabloggers who have distinguished themselves in the April A-Z blogging challenge. Congratulations Helen Connor, Jennifer Jones, Judy Lofthouse and Anne Young for completing the challenge. This mroning a post from Susan Petersen, one of my genimates in the US, appeared in my feed. This is one of the best posts I have read in a long time and is at the top of my must read posts this week. 1. 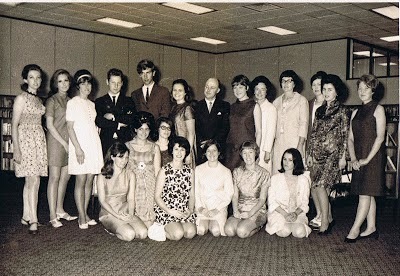 Whether you are a member of a genealogy society or not you must read Susan's post. 5. Shelley is doing amazing work with Family Historian Plugins.